Online visitor registration is now officially open for those looking to attend Securex West Africa 2019. 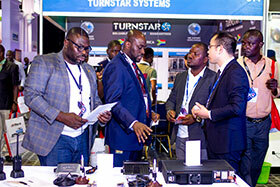 Taking place from 16 – 17 April 2019 at the Landmark Centre, Lagos, Nigeria, this year organisers have confirmed more than 80 global brands will be participating. With a record-breaking 2344 attendees and at 696 m² of floor space, the 2018 event was the largest edition of Securex West Africa to date. Attendees increased by 24% from the previous year and that trend is expected to continue into 2019. Positioning itself as a truly international event, the exhibition attracted visitors from 17 different countries, the top five of which included Nigeria, Benin, Cameroon, Senegal, South Africa and Togo. Brands already confirmed to showcase their products and services include: Assa Abbloy, Centurion Systems, Hytera Communications, Kontz Engineering, Mobiak S.A., Optex Europe, Turnstar Systems and many more. You can view the full list of exhibitors and their products on the show’s website. With stands still available, those interested in exhibiting this year at Securex West Africa 2019 are encouraged to make an enquiry to Ben Dale, international sales manager for the event at ben.dale@montex.co.uk or via telephone on +44 20 7886 3048.